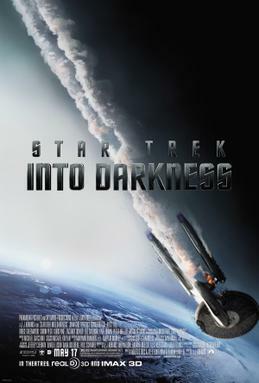 “Star Trek: Into Darkness” is the second neo-Star Trek film. The rebooted version of the Star Trek universe is, I presume, a parallel reality to the original version, created when a Romulan starship chases Ambassador Spock into an artificial black hole. Hard line Trekkies will know of precedents in the original series. The plot of “Into Darkness” is quite interesting. A Starfleet admiral makes the elementary mistake of awakening Khan Noonien Singh, the most popular villain from the original series, and forces him to develop sophisticated weapons intended for use in a future war against the Klingon Empire. Naturally, Khan turns into a “Frankenstein's monster”, escapes and seeks revenge. James Kirk, Spock and the crew of the starship Enterprise soon find themselves embroiled in a cosmic conspiracy of explosive proportions! While the scriptwriters may not have intended any political message, the parallels to how the Anglo-American establishment has been using Al-Qaeda and other terrorist groups is striking. It usually ends in the same way: the monster gets away and bites its master. But perhaps that was the purpose in the first place? While the rebooted Khan is very different from the original version, I admit that I found Benedict Cumberbatch convincing as a cross between Superman and a Borg. The only problem is that Khan doesn't look Sikh, but then, he didn't look particularly Sikh in the original series either. Maybe just as good, since Khan is supposed to be the bad guy! Otherwise, I found “Into Darkness” to be somewhat chaotic. There are too many twists, turns and frankly irrelevant subplots. Who cares about Spock's relation to Uhura-whose-name-means-peace? The film could easily have been much shorter without all the filler. Also, Kirk gets away too easily when he breaks Starfleet regulations (which he does on a regular basis). This was convincing in the original series, where Kirk was a seasoned and popular starship captain, but it's downright illogical here, where Kirk is just as young brat. But then, perhaps it's illogical to accuse a science fiction film for being illogical, ha ha! Of the other characters, “Bones” comes pretty close to the original version, sometimes too close. And yes, the joke about the tribbles was funny in an in-universe kind of way. “Scotty's” little midget, alas, is not.